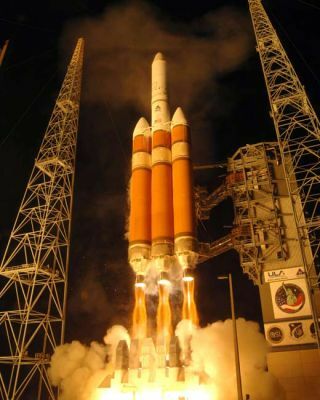 United Launch Alliance’s Delta 4-Heavy rocket carrying a payload for the National Reconnaissance Office successfully lifted off from Space Launch Complex 37 at CCAFS at 9:47 p.m. EST on Jan. 17, 2009. WASHINGTON-- Executives from several private space companies said Wednesday that theycould provide cheaper, more reliable launch systems than those of NASA'sConstellation program. The executivesmade their comments about alternatives to NASA's plan for sending astronautsto the moon and on to Mars during the first meeting of the Review of U.S.Human Space Flight Plans Committee created by President Barack Obama. After thedaylong meeting, committeeChairman Norm Augustine, a former CEO of Lockheed Martin Corp., said somecommercial launch efforts appear "further along than I thought." MichaelGass, the CEO of United Launch Alliance, told the committee that the companycould use an existing Delta rocket to launch the Constellation project's Orioncapsule into space sooner and at a lower cost than NASA's planned Ares Irocket. And GaryPulliam at Aerospace Corp., which was hired to look at other ways to launchOrion, said a modified Delta IV Heavy rocket could save between $3 billion and$6 billion compared with the Ares I. But Pulliamalso noted that NASA has said canceling the Ares I project would add $14.1billion to $16.6 billion to the cost of developing the larger Ares V rocket,which NASA hopes to use to take the Orion capsule farther into space, includingto Mars. Executiveswith SpaceX and Orbital Sciences told committee members that they could helpNASA ferry astronauts to the InternationalSpace Station, filling the gap between the end of the shuttle program in2010 and the start of Constellation. SpaceX CEOElon Musk also said that using private firms to servicethe space station -- both for supplies and people -- would free up NASA tospend its funds on more ambitious space exploration. NASA has contracted withboth firms for a total of 20 missions to service the station. SteveMetschan, part of a group called Direct, offered the most provocativepresentation, which proposed using existing shuttle components to create a newlaunch system that would be cheaper and already tested. He addedsome drama by imploring panel members to allow people working on the Ares Irocket to talk to the panel anonymously about problems with the project. Earlier inthe day, NASA officials told the committee that they're dealing with concernsabout the lift capacity of the Ares I rocket, its ability to safely clear thelaunch tower and potential vibration issues during launch. Augustinecited the vibration problem as among the most striking issues brought up on thefirst day. Others, he said, included the availability of commercial rockets asan alternative way to launch the Orion and the concept of reusing the shuttlelaunch system. recommendationscould be "the significant influence for the White House and the Congressfor where the space program is going." Thecommittee's report is due by the end of August. The panel also includes formerastronaut Sally Ride, the first American woman in space, and Lester Lyle, aretired Air Force general who was on Obama's shortlist for NASA administrator. Published under licensefrom FLORIDA TODAY. Copyright ? 2009 FLORIDA TODAY. No portion of this materialmay be reproduced in any way without the written consent of FLORIDA TODAY.